The cleanup has begun. Although parts of the city remain in darkness and quite a few people, many of them seniors, remain out of their homes, the water levels are steadily receding. And with it, volunteers with strong backs and rubber boots are descending upon devastated neighbourhoods. The city's git er dun spirit is bursting forth from every mud-covered neighbour. 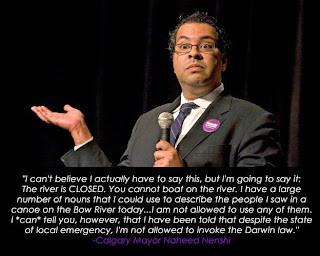 From the start, Mayor Nenshi has been a beacon of sensible leadership. Among the populace, the mayor's cache has reached almost godlike status. Flanked by a dedicated team, he has spearheaded the flood fighting efforts with unflagging energy, realistic optimism, and an undampened sense of humour. 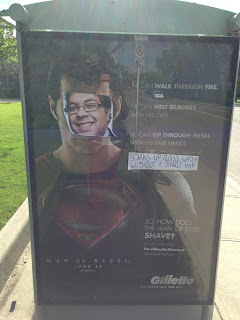 About three days into the flood, the twitterverse started a movement to force Mayor Nenshi to take a nap, and memes began popping up around the themes of Nenshi nouns or depicting the mayor with his face superimposed over a bus shelter ad for the new Superman movie. As thoughts naturally began turning to flood relief fundraising, local Bad Portraits artist Mandy Stobo designed what has already become an iconic symbol of the 2013 flood, a tee-shirt shirt depicting Nenshi in a scuba mask. I am pretty sure everybody in Calgary has already ordered at least one of these. The city is doing an incredible job of repairing infrastructure. A major thoroughfare into downtown, that the flood waters had completely demolished, just reopened this morning. One of the lanes is now designated bus only, since the LTR tracks running through the adjacent tunnel are completely buckled and twisted into surreal shapes. Although not currently train-worthy, you know it won't take long to get that repaired. But it's not just a matter of great top-down leadership that is driving the reconstruction. Mostly, it's way more grassroots. When the city put out a call for 600 volunteers to muster at McMahon stadium to start cleaning out flood-ravaged houses, they weren't prepared for the 7,000 that turned up. Smaller centralized efforts immediately began springing up around the city, and many many people now simply show up at a house - any house - ready to pitch in. It continues day after day after day. You hear stories, of the homeless man who rides his bike daily to an area that needs assistance and just starts helping. It's one thing to pitch in and get mud-caked when you can go home to a shower and clean clothes, quite another when you call a shelter home. Some of the stories emerging are heart-wrenching: an elderly woman who died in her flooded home, pictures of found dogs with captions asking do you know him?, irreplaceable mementos ravaged by water and mud. But mostly, the stories are of generosity: people offering homes, people showing up with food and coffee, people driving from house to house with pumps and shovels, people determined to keep getting sore and muddy day after day until the job is done. The next step, the flood relief fundraising, is now beginning in earnest. And knowing Calgarians, I can guarantee that the matter of raising funds to help rebuild will become a great big party. Or, possibly a lot of little parties. But probably both. Because this is my Calgary. I saw the newsclip when Mayor Nenshi was talking about the folks in the canoe. Hilarious! I agree that much of the work is originating at the ground level - literally. It is so heartwarming to hear that so many volunteers showed up to offer help. Way to go Calgary! The volunteering shows no signs of letting up either, Kathy. Calls for hundreds of people to tackle some pretty tough situations are filled in a couple of hours. Great to live in a city of young folks! Slow and steady wins the race. Sounds like you've got great leadership in place to set things right. Sorry about that beast of a flood. Wish we could swap an excess of rain for a lack thereof. We've been in a Stage III drought, and it's illegal in my town for anyone to water their lawn or garden except for two designated days a month, and then it must be hand-watering-- not a sprinkler system. We need to kick the feast-or-famine thing to the curb, oui? Glad you and yours are okay, though.